You can follow the steps below to make DIY iPad covers for your friends, family members or yourself. These covers make great birthday gifts, anniversary gifts and even return gifts. Make sure that your placemat is durable, stylish, thick and strong. Picking out a good placemat is the most important step of this project because it has to bear the weight of your iPad. If you don’t have a suitable one at home, you can check out different woven placemats online, such as Food Network’s stria woven vinyl placemat in charcoal or a Home Studio woven placemat in pink or mustard. The woven design of these placemats lends a fashionable touch. Place your rectangular placemat horizontally on a flat surface and measure its width. If your placemat is 24 inches wide, place your iPad 8 inches away from the left corner of the placemat. 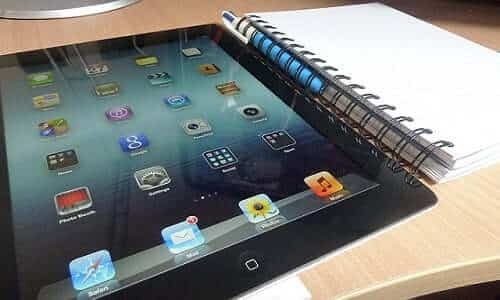 Now fold the left and right sides of the placemat over your iPad. Your folded placemat should now look somewhat like an envelope and be 10 inches tall and 15 inches wide. Place your covered iPad horizontally on your surface. Use colored or clear tape to connect the front of your placemat to its back. To do so, leave the upper flap open and stick the tape on top of the lower flap. Flip the iPad over to the reverse side and join your tape’s ends on this side. Now close the vertical edges of your cover with five or six layers of black tape. Move your cover and see if your iPad shifts from one side to the other. If it does, simply take a needle and some thread and stitch a line to eliminate the extra space on each side. Now grab some Velcro with a sticky back, take off its backing and stick it onto the front of your iPad cover. This will allow you to close your cover. Now bring the upper flap down, press it into the Velcro and you’re done! In addition to making a nice iPad cover, you can pick out an STM jacket for iPad and decorate it the way you want. This lightweight jacket allows you to travel easily with your iPad. Have fun making these two items for your iPad and making a fashion statement at work and everywhere else!